Last weekend our next door neighbors had a guy power washing their house, patio, and outdoor furniture. It didn’t look like a particularly glamorous chore, but it was effective: sheets of brownish water cascaded from the house, and the place virtually sparkled when he was done. I casually asked how much the service had cost, and they told me it was $650. But then I checked pressure washer prices online at Home Depot, and found I could buy my own power washer for about $400. Because I’m now retired, I saw no reason to pay a $250 premium for a job I could readily do myself. And if I do the job every year, I’ll save that much more. So on Monday I bought a Ryobi brand power washer with a Honda gasoline motor that pumps out 2.5 gallons of water per minute, under 3,100 hefty pounds of pressure. And I quickly discovered that it also delivers something they don’t specify on the box: tons of fun. As boys, my brother and I had high-quality magnifying glasses we’d salvaged from a never-used science kit Mom gave us for Christmas. If you held it at just the right angle, the lens focused the sun’s rays into an intense, white-hot beam that you could use to inflict a nasty pinpoint burn on your unsuspecting brother’s arm (precipitating more than one fistfight), or to start fires in piles of dead leaves. Or you could play God. Magnifying glasses in hand, we would go out on a hot summer day looking for ants. Not solo meandering ants, but thousands of ants in a boiling pile, massed on a melting ice pop or glob of gum stuck to the sidewalk. If you held the glass five inches above the ants and got a good focused beam going, you could sweep it slowly across the pile, instantly crisping every ant in its path. As the beam advanced, the unlucky ants would give off a minuscule wisp of smoke, then twist, wither and fall under the writhing mass of their brethren. While it sobered us momentarily, that image didn’t abate our enthusiasm for the grisly task at hand. Ants are slightly alien anyway, and there are millions of them, so mass murder seemed appropriate. It was exhilarating and empowering – just like my new power washer. I hooked up the water supply, filled the tank with gas, and fired it up. The motor idled, deceptively tame, until I picked up the long metal wand and pulled the plastic trigger. The engine immediately belched to a high-pitched roar, and water jetted from the end of the hose with such force that the wand recoiled, dancing in my hands. I tried it on the narrowest setting and the needle of water promptly etched ragged quarter-inch deep lines into the artificial wood of our deck. But when I dialed it down to a wider setting and directed the pulsing spray at the vinyl fencing around our back deck, the result was miraculous. 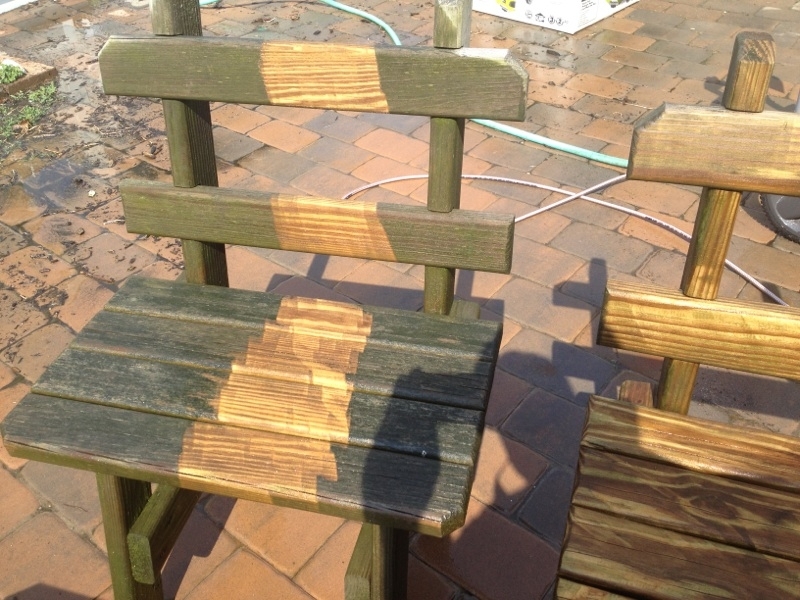 Years of dirt and green mildew that would have taken tedious hours to scrub off by hand was blown away in minutes by the power washer’s brute force. Then I turned to the picnic table and benches, which are pressure-treated wood that I’ve never bothered to stain or varnish in the decade we’ve owned them. The salesman rightly said you didn’t have to because the wood, even unfinished, doesn’t rot like untreated wood. But it does become “weathered” over time, which means (thanks to the rampant growth of all forms of mold), it turns from its original cinnamon brown to an ugly, blotchy black/greenish gray. Enter the power washer – wand of watery death for mold spores living on wood. If I set the spray width just right and held the wand close enough to the surface, I could blast paths of greenish mold off the wood with a single pass. Once again, I held incredible power in my hands. Only no ants or other potentially sentient creatures were injured or killed this time around (unless you consider mold spores intelligent life). Giddy with power, I sprayed every square inch of every bench; every table; every piece of grimy vinyl in the yard. I even cleaned the concrete sidewalks. It was great being a boy again.